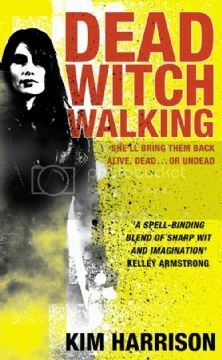 Dead Witch Walking by Kim Harrison - A witch for Inderland Runner Services - the police after the supernatural baddies - she decides to leave and set up her own agency after getting jobs unworthy of her skills. But no-one leaves the I.S. Rachel has to pay off her contract, so after a discovering that the upstanding Councillor Trent Kalamack might be drug lord, she goes all out to try and bring him in, and get the I.S. off her case, while dodging assination attempts. But going after Trent could be a greater risk than leaving the I.S. It was pretty good, there I wasn't too keen on how some questions brought up weren't answered, meaning you have to read the following books to find out. I haven't read the following books yet, so there may be a reason for it, but from what I've read, it just seems odd that there were these important questions, yet no answers. But I'll definitely be getting the next one.